And right now is the point at which I tell you about Stonehouse Pizza parties that manage to combine my love for pizza and take away the stress of a party, all in one fell swoop. 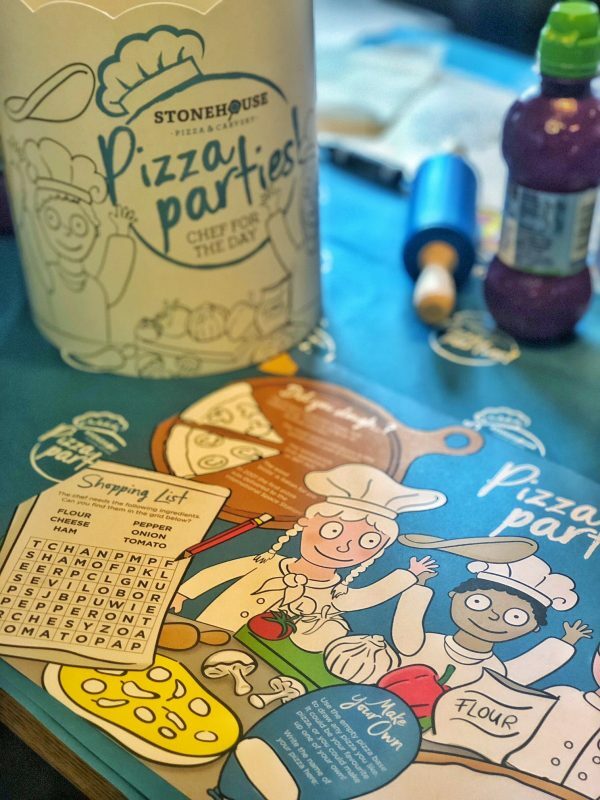 We were invited to go and try out a Stonehouse Pizza party a little while ago and I can honestly say that I was SO impressed. 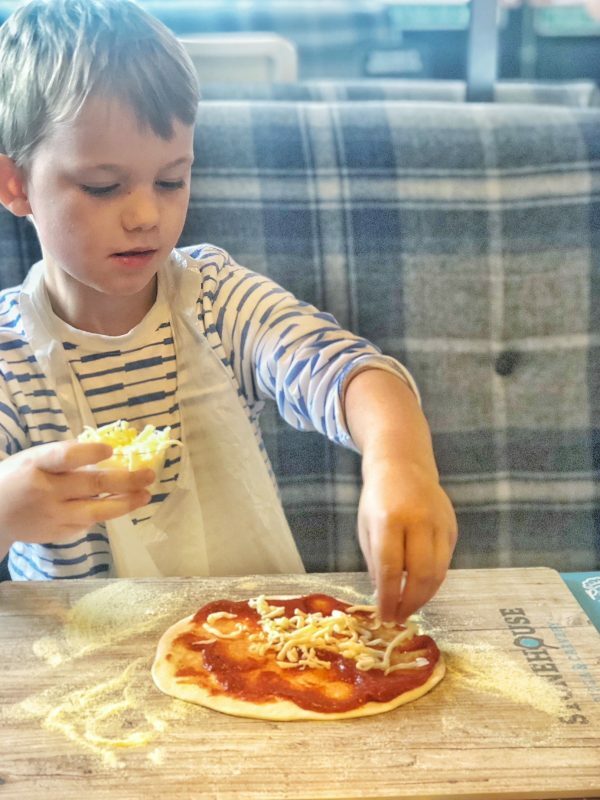 Our nearest location was Leeds, however Stonehouse Pizza and Carvery restaurants are scattered across the country, you can find your nearest one here. So what exactly does one do at a pizza party other than scoff pizza and chat with friends? 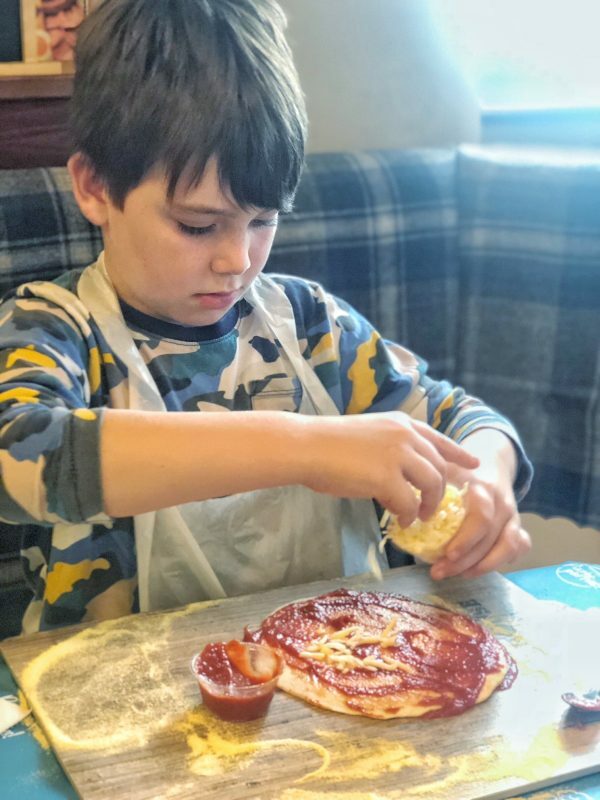 Well, when you’re having a pizza party at Stonehouse and you’re a super cool 7 year old, you MAKE your own pizza. As soon as we arrived and we went round to the Pizza area, the fun began. 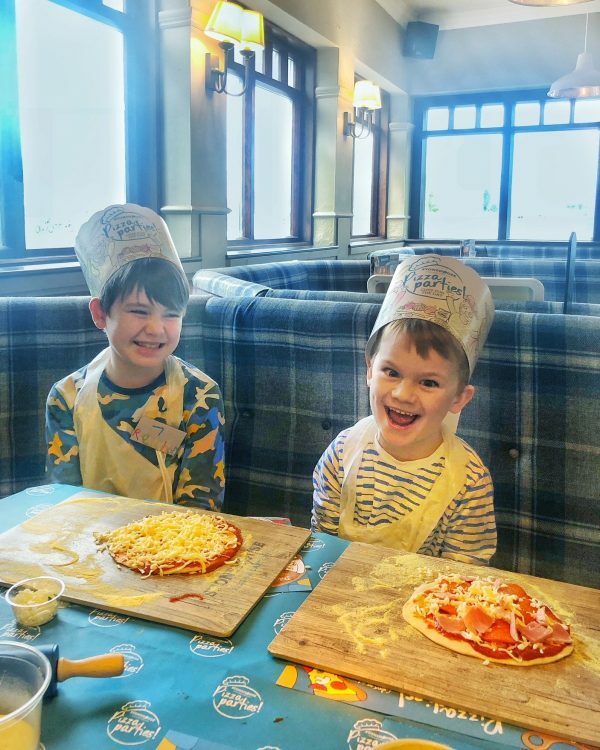 The boys sat down, coloured in their chef’s hats, had a drink (included in the party package) and then went to wash their hands, before getting ready to rollllll that pizza dough. 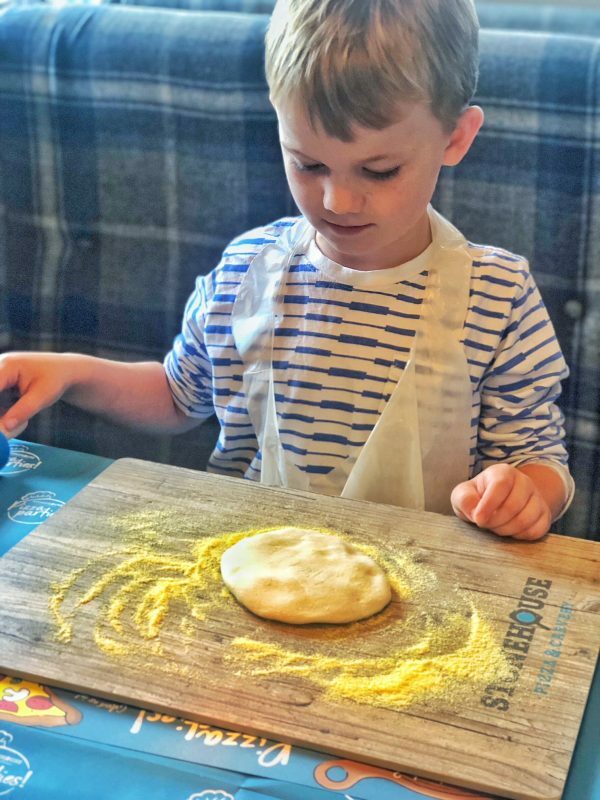 The dough is sectioned out into balls for each of the children and your dedicated pizza party host will explain to the kids exactly how to roll out the dough, complete with polenta – and it doesn’t matter about the mess, it’s all part of the fun! 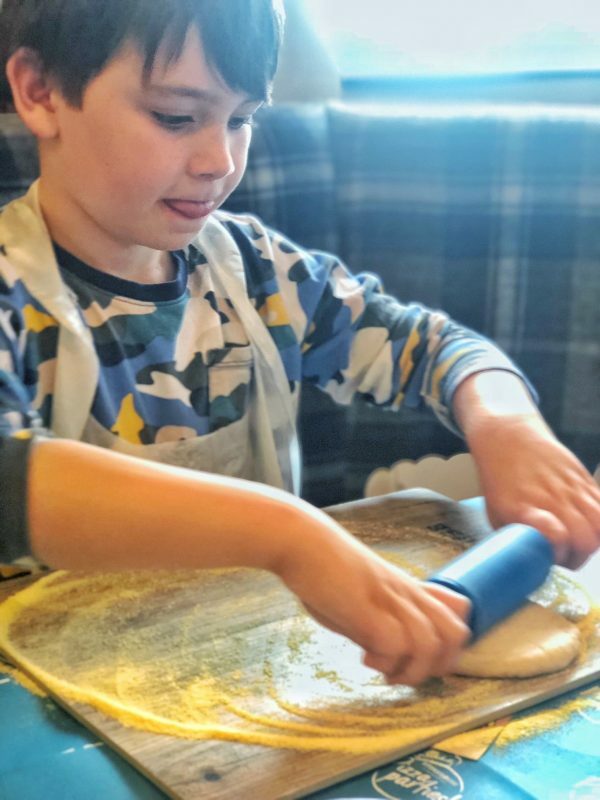 Next, each child is given a pot of tomato sauce and shown how to spread across their pizza based once it’s thin enough – if they are anything like Reuben they will go crazy and create some kind of to the edge variation of pizza, Toby was a bit more conservative. Next, the cheese and toppings of your choice. 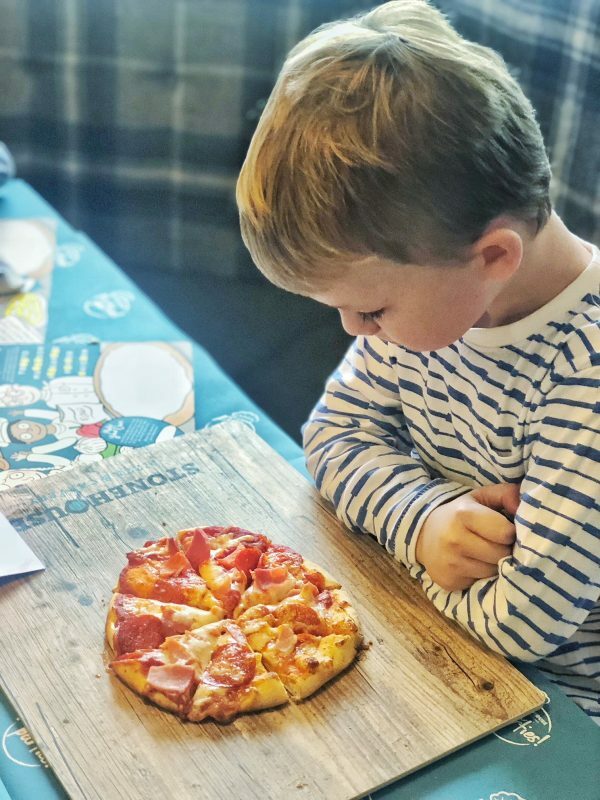 There was mushrooms, pepperoni, chicken, ham and peppers – we were also told that if there was anything anyone would like, we just needed to say, making sure that all the children, no matter what they usually have on their pizza (be it meaty like Toby’s pizza or just cheese like Reuben). 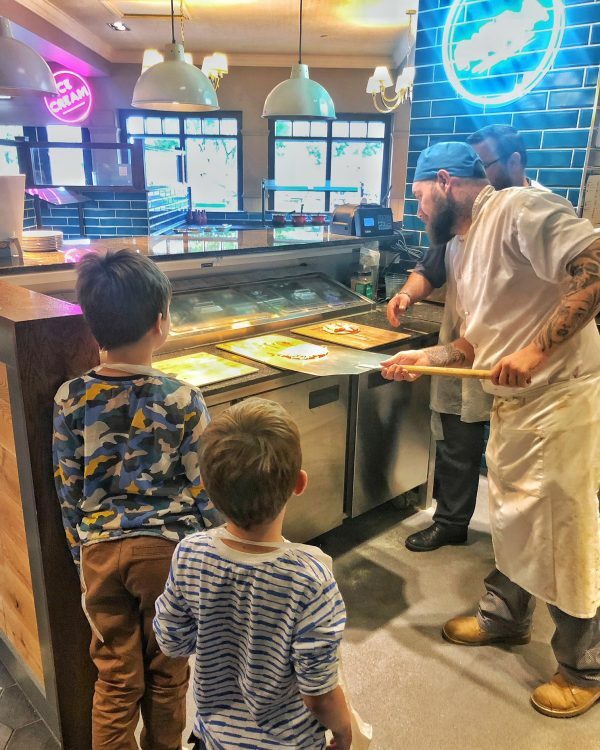 When the pizzas where done to the chef’s liking, the children were taken to the oven area, asked to stand a safe distance back and shown the chef putting the pizzas in the ovens – these then take 10 minutes, just long enough to nip to the loo, have a bit of a play outside in the play area or perhaps sit and chat with friends/do some more colouring – whatever they want. Then – FOOOOODDDD TIMEEEE. 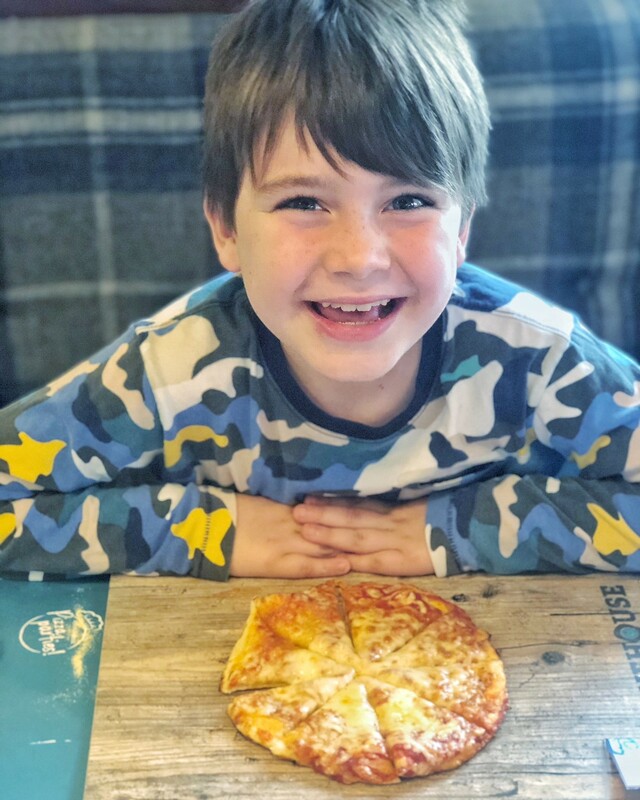 Alongside the pizza the children have an unlimited chips, salad and vegetables from the carvery, which means that absolutely everyone gets a full belly. 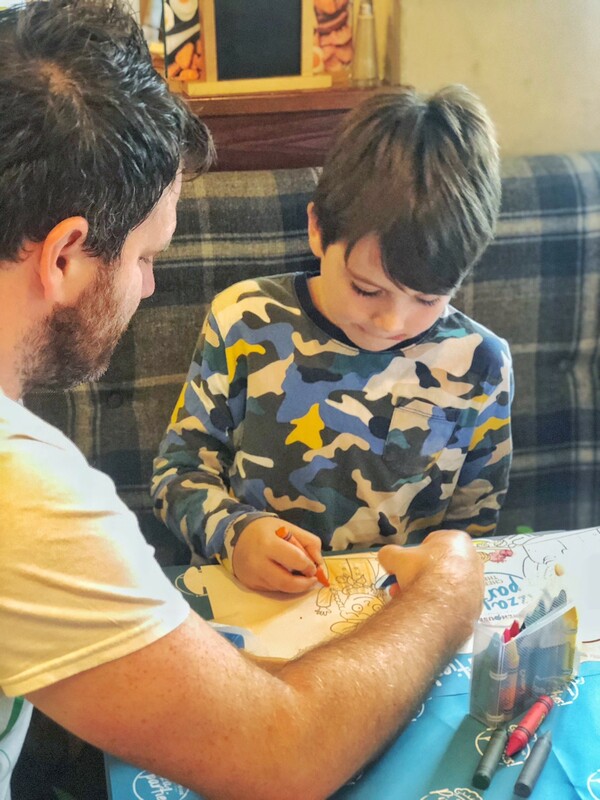 If parents want to order something then they can do, pizzas, burgers and carvery are all available and all come with unlimited veg, chips and salad from the carvery bar. 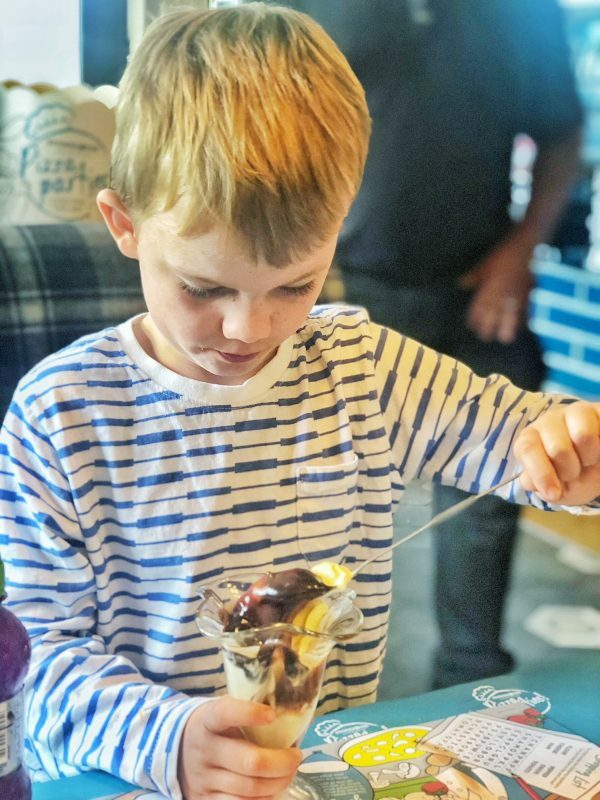 Once we’ve got the mains out of the way, it’s time for ice cream – again, unlimited and again, included in the price of the party. 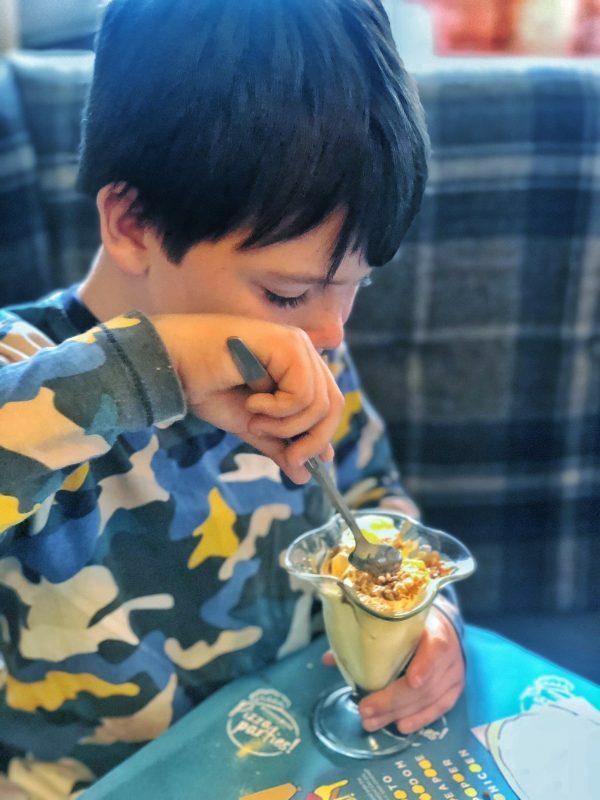 When the kids were eating Adam and I had a chat with our host to crunch numbers, how much would this cost, surely if the last party we went to (soft play) was £12 per child for 2 hrs play and some basic party food, this must be a similar fee? It turns out no, for all of this food, the fun of a party where you make your own pizza, was only £6 per child! Whilst I can’t attest for every Stonehouse Pizza and Carvery restaurant, the one that we went to had a lovely play area outside and there was 100% room for a bouncy castle, rounding off a party perfectly. I think I know what I would like for my 30th now though, and it involves ALL the pizza! Previous Post 16 tips for Disneyland Paris plus WIN £500 primark spend! Next Post Sniph fragrances :: The ultimate Perfume addicts dream. What a great idea, something so simple but so effective! 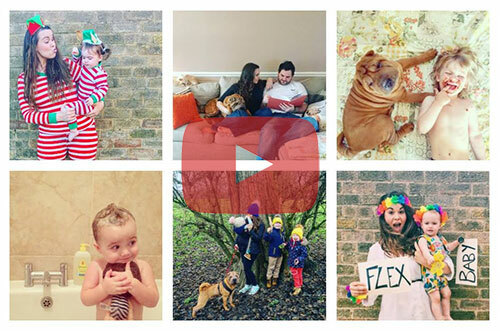 It is a great way to do something different!